I have been doing precious little cooking, and therefore precious little blogging, in the last few weeks. 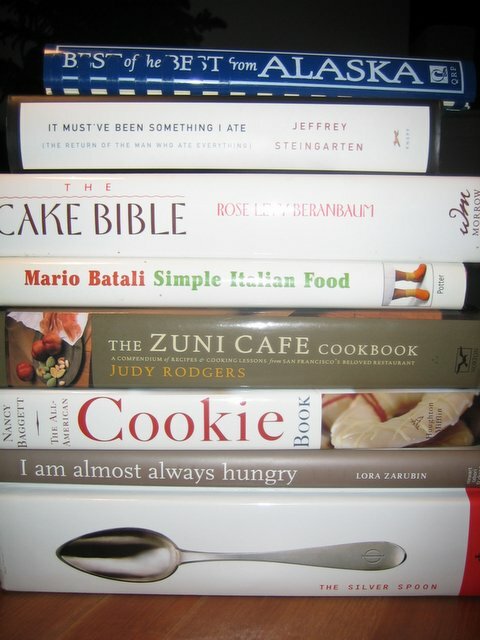 (Stupid life, getting in the way again…) That hasn’t stopped me from obsessing about cooking, and, if anything, it has caused an uptick in my barely-controllable cookbook buying habit. It’s always an exercise of the will to stop myself from randomly acquiring cookbooks, particularly when there are so many used bookstores within easy walks of work and home, but when I don’t actually have time to use them, I’m even more desperately tempted to pick up a new treasure. Whether it’s to inspire myself to make an effort or just to use the vicarious thrill of reading about cooking as a substitute for actually doing it, I’m not entirely sure. By way of illustration, these are the books I’ve acquired over the last two months. Three of them were holiday gifts, but there’s really no excuse for the other five, not that it stops me from trying to rationalize the purchases anyway. 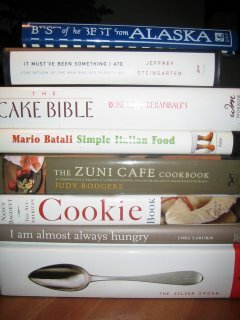 The Batali book was because I have sadly few Italian cookbooks, and such a glaring lapse must be remedied. The two baking books are, of course, because my existing resources are really not good enough if I’m going to try to bake-and-blog every Sunday. I owe it to my many (by which I mean probably half a dozen on a good week) readers to provide variety, don’t I? The sad part is that I’m pretty sure I haven’t made a single recipe out of any of them yet, unless you count the hot chocolate recipe in the Steingarten book — and I wouldn’t, because I acquired the recipe way before I acquired the book. I suppose, as addictions go, this one is pretty harmless (although His Lordship curses it soundly every time we move, and he has to risk a hernia with each overfilled box). Still, I ought to make more of an effort to use them, or at least to stop picking them up on auto-pilot and then letting them sit on the coffee table, mocking me with my own imprudent impulsiveness. Is there a twelve-step group?